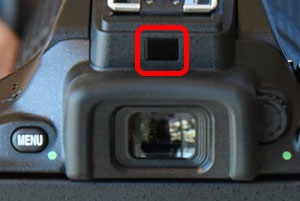 Nikon D5500 proximity sensor failure? I've been struggling with this for some time, & I feel the issue has been getting worse. The rear screen of my D5500 works perfectly - when I press the menu button, or the 'view' button for the last picture taken, or put it in Live View. There is nothing wrong at all with the screen, per se. Other than that, it only works if I switch off "Info display auto off" in the settings menu - which is irritating, as the 'screen of when eye in position' is rather useful. Pressing the Info button does nothing, half squeezing the shutter release does nothing. The display in the viewfinder does what it ought, but the rear screen does not want to be my friend. I'm aware there's a proximity sensor, but wasn't sure a) where it was or b) what could interfere with it. My tripod mount, or macro rail was being 'seen'. Nope. My remote release cable. Nope. The fact I have extension tubes attached. Nope. Forgive this self-question/answer, but I thought it may help anyone else with a similar issue, which had eluded me for months. I do, of course, now feel remarkably stupid for not having figured it out earlier, however, think the blushes worth it. The smallest piece of grit, dirt, finger smear or generic gunk on it or near it, on an otherwise spotless camera body, will play merry hell with the actual proximity of your face & the recognition of that fact. So, the fix was simply to clean the sensor & the area around it. Hammock suspension system: Could Case Logic's suspension system harm the camera? How water-resistant are Nikon's weather sealed lenses?